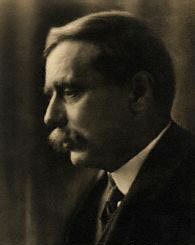 H. G. Wells was an English writer whose science fiction stories played an important role in influencing popular conceptions of the nature of extraterrestrial life. The first novelist of his genre to receive a thorough scientific education, he held a bachelor's degree from the Normal School of Science (later renamed the Royal College of Science) in London, and had been tutored by none other than the biologist Thomas Huxley, famed for his epic public encounter with the creationist Bishop Samuel ("Soapy Sam") Wilberforce at Oxford in 1860. Huxley had been a close friend of Charles Darwin. Now, following Charles's death in 1882-the year that Wells first began attending Huxley's lectures-he was the new chief standard-bearer for Darwinism. Wells, therefore, could not have found a better teacher from whom to learn about the theory of evolution and all that it implied. There is ... no guarantee in scientific knowledge of man's permanence or permanent ascendancy... [I]t may be that ... Nature is, in unsuspected obscurity, equipping some now humble creature ... to rise in the fullness of time and sweep homo away ... The Coming Beast must certainly be reckoned in any anticipatory calculations regarding the Coming Man. But the threat to humankind, Wells realized, might come not only from some lower species which subsequently evolved to take our place. In The Time Machine, the "Coming Beast" is man himself, or at least a bestial form of Homo that, in the far future, has diverged from a gentler, feebler strain of humanity that represents the other extreme end-point of our development. Then again, perhaps the challenge to humanity would come from beyond the Earth and from a creature that was our intellectual superior. On April 4, 1896, Wells's article "Intelligence on Mars" appeared in the Saturday Review. It begins by referring to a "luminous projection on the southern edge of the planet" seen by Javelle at Nice. The report of Javelle's sighting in Nature, some eighteen months earlier, had led to a flurry of speculation that the light was an attempt by Martians to signal to us (see Mars, changes on). Wells went on in his article to ask what sentient life on Mars might be like. He was scornful of earlier suggestions that the inhabitants might resemble ourselves. No phase of anthropomorphism is more naive than the supposition of men on Mars. The place of such a conception in the world of thought is with the anthropomorphic cosmogonies and religions invented by the childish conceit of primitive man. The Martians, he concluded, "would be different from the creatures of earth, in form and function, in structure and in habit, different beyond the most bizarre imaginings of nightmare." A year later, he gave full reign to such speculation in The War of the Worlds. Wells further explored the variety of forms that extraterrestrials might take in his writings on silicon-based life and his 1901 novel The First Men in the Moon.